Ronnie Frostad is a sculptor herself and works closely with her experienced staff to ensure excellent castings. There are no sculptures too small or too large for the foundry to produce to perfection. The foundry has produced some of the largest sculptures in the world over the years. Each step in the casting process is checked by our foundry supervisors and Ronnie for quality control, and the artists have the opportunity to check their sculpture at the wax, raw casting, and finish stages for acceptance. The casting process is known as lost wax and dates back thousands of years. Techniques have improved over the years, but the process is essentially the same. Our foundry offers all steps of the lost-wax. Mold Making—Eric Zeiszler, an experienced master mold maker, is in charge of the mold department. Our excellent molds are made of rubber with an outer fiberglass mother mold. Wax Work—Our wax department workers pour wax into the mold to create a positive image of the original sculpture approximately ¼ inch thick. Our “wax chasers” then remove imperfections in the wax and attach wax gates or vents in preparation for investment. Investment—In our slurry room, a ceramic shell is created around the wax sculpture by dipping the wax into a slurry mixture a number of times allowing drying between dips. 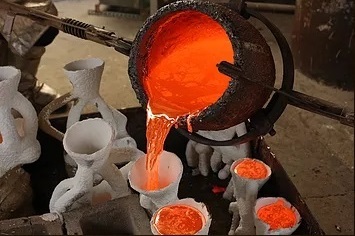 Bronze Pour—After the wax is melted or “lost” by heating the shell in the kiln, molten bronze is poured into the empty shell to replace the wax—hence “lost wax”. Metal Finish—Our experienced metal finishers “chase” the raw metal sculpture back to its original appearance. Patinization—Our expert patineurs apply the patina or color to the finished bronze sculpture. Infrastructure—We work with structural engineers for design of stainless steel infrastructure. Transportation and Installation—We have shipped and installed large, monumental sculptures to all parts of the United States. Molten bronze being poured into a hot shell at 2000 degrees Fahrenheit.